Following some notes around netcat here and here. lz4 can be downloaded here. bzip2 can be downloaded here. 7-zip can be downloaded here. netcat can be downloaded here. An interesting article about how to perform a network capture when no tools are installed locally. Quoting the winpcap web site : « WinPcap consists of a driver that extends the operating system to provide low-level network access and a library that is used to easily access low-level network layers ». Lets use it to perform a quick and easy man-in-the-middle-attack with arp spoofing. Quoting wikipedia : « a man-in-the-middle attack (MITM) is an attack where the attacker secretly relays and possibly alters the communication between two parties who believe they are directly communicating with each other ». Source code and binaries are available here. 192.168.1.125 is victim (a computer on my network). 192.168.1.250 is my network gateway/router on my network. 94DE80-C2A41E is my mac address (i.e the attacker mac address). 192.168.1.125 will believe that mac address of the router (192.168.1.250) is mine i.e 94DE80-C2A41E. 192.168.1.250 will believe that mac address of the victim (192.168.1.125) is mine i.e 94DE80-C2A41E. In effect all traffic between these 2 hosts will go thru my computer. One important thing not to forget : enable forwarding on your computer or else all traffic between these 2 hosts will be dropped. Now you can perform an attack with intercept-dns from a previous article (dont forget to do a set layer=forward on the command line then). 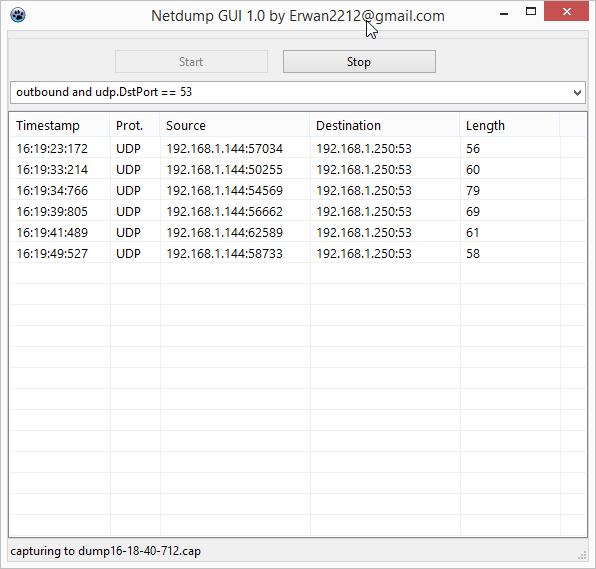 Or simply sniff/capture the traffic with netdump. Note that you could also use a GUI like Iptools to perform arpspoof. See example screenshot here (C=client/victim, R=router). Last article of a series of 4 articles. -spoof a remote hostname with our local ip (using tool in step above) – these 2 steps could be skipped if you modify your local hosts file. And tada, launch your chrome browser and browse https://www.fakedomain.com/ and chrome will be happy. Playing around with intercepting traffic (diverting, mitm, etc), I needed a standalone DNS server. 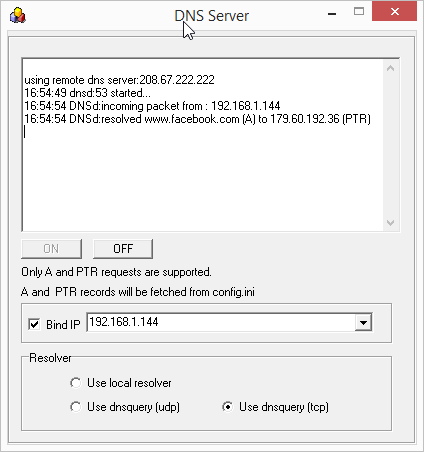 You can use the local windows resolver OR use dnsquery which then allows you to choose between UDP/TCP and remote DNS server. Remote dns server has to be set in the config.ini file (see included ini file). Still via the config.ini, you also « spoof » A or PTR records (example : have www.facebook.com resolve to 127.0.0.1). Previously we have built a HTTP server. This time, lets build a HTTPS server. The main difference compared to previous article is that this time, we need an object of type TIdServerIOHandlerSSLOpenSSL to provide certificates details and to handle the ssl part (client hello, server hello, etc). -generate a csr (only the CN field matters and must match your local site – example : localhost or 127.0.0.1). In previous article we installed indy 10 in Lazarus. Lets now build a lightweigth HTTP server. All it is really is a tcp server listening on port 80, parsing the incoming request and sending back the content of the requested file. All the « magic » really happens below.